I found my first few grey hairs the other day. Naturally, my hair is very dark. However, for years, I dyed my hair blonde. All of my “blonde fun” has since grown out and I no longer use any chemical dyes on my hair or scalp — but have I already done damage? Why do some people develop grey hair before others? There are some ladies in their 50s who still proudly show off their natural brunette locks, whereas others go grey at 20. Why is this? Although science is always evolving, as we learn new pieces of information, it is well-understood that each of us is unique. With that being said since age is the biggest culprit when it comes to a silver mane, many researchers have developed what’s known as the 50-50-50 rule. This means that approximately 50 percent of the population will have around 50 percent grey hair by the age of 50. In addition to age, ethnicity also plays a key role. If you are a redheaded Caucasian, statistically, you will go grey earlier than anyone else. Outside of genetic factors, our lifestyles also impact our hair color and overall hair health. From the foods we eat to the ways we manage stress, our lifestyles significantly impact the health of our hair and skin. You are beautiful, grey hairs or not. The only reason you think otherwise is thanks to the culture we have created. As long as you can practice self-love and shrug off those who feel the need to express their opinion, you can avoid the following negative impacts associated with hair dye. Depending on your regular hair dying process, you likely expose your skin and scalp to hair dye every eight weeks or so. Yep, even those who opt for “organic dye” — because well, no matter which way you slice it, there have not been any chemical hair dye breakthroughs in 100+ years. Meaning, even if a “natural” dye uses a lower percentage of chemicals or incorporates organic coconut oil, these options still expose you to the same conventional chemicals. As stated by the National Cancer Institute, more than 5,000 different chemicals are used in conventional hair dye products. Although formulations have changed over the years, removing some of the most harmful carcinogens, most still contain additives such as Quaternium-15 (which may release formaldehyde); APEs (which are believed to disrupt hormones); and Phenylenediamine (a known irritant that is also considered to be an environmental toxin). The reason that we all frantically dye grey roots isn’t because it will reverse the clock, but because we feel as though we need to based on our culture — a culture which we created. 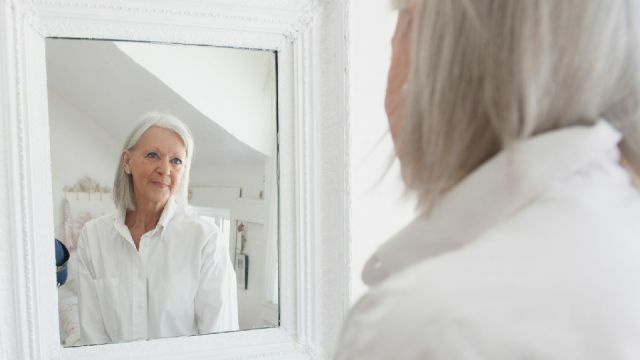 The development of grey hairs is something that showcases where you are in your life. It’s not something that should be looked down on. After all, it’s the norm. Aging gracefully is something that should be celebrated. Meaning, a sign of grey hair isn’t something to discriminate against. By feeling as though we must dye our greys, we simply perpetuate ageism. In Native American culture, for instance, grey hair is a symbol of wisdom and respect. It’s simply our cultural thought process that makes us think otherwise. So many of us work extremely hard — and in most cases, we’re regular working class folks. If you get your hair dyed every six to eight weeks, you know how quickly a simple color and cut can drain your spending money. You also often have to give up your day off to sit in a chair with a head-full of foil. For those who don’t believe they can afford to eat healthily, take your hair dying money and see how far it gets you at your local farmers’ market. You’ll be surprised (and delighted) by the people you meet and the fresh foods that offer. While you support your health, you’ll also support your local farming community. Looking for a subtle and truly naturally dying option? If so, there are many natural alternatives available, some of which you may already have in your home or kitchen. Although you can alter your hair color naturally, these options will not produce the same results as chemical dyes. The color of tea comes from tannins, which are plant polyphenols. There are a wide variety of teas and if you leave them in your hair long enough, you will notice a subtle difference. For those looking to go darker, organic espresso is the way to go. Simply spray it on and allow it to sit for an hour under a shower cap. Rinse (but don’t wash). Want to go pink or red? Beets can temporarily do the trick. Simply combine the juice from two beets with a couple teaspoons of olive oil. Wearing gloves, work the mixture into your scalp. Once again, allow it to sit for an hour before rinsing. One of the most popular natural dying options, henna is produced from powdered leaves. It will make your hair a deep black. While dying your hair, you will definitely want to wear gloves, as this pigment stains very easily. To avoid staining your face, it is recommended that you apply a thin layer of Vaseline to your hairline. If you would like to naturally lighten your hair without using any bleach, lemon juice is all you need. Well, you’ll also need the sun, as lemon juice is heat activated. Simply juice a couple of lemons and pour into a spray bottle. Spend some much-needed time outdoors and let the sun do the work. So, ditch conventional dyes and test out a few natural DIY methods. Once they wash out, take pride in your distinguished look and be comfortable with who you are! Hey Buddy!, I found this information for you: "3 Reasons To Stop Dying Grey Hairs (Plus 4 Natural Hair Colorants)". Here is the website link: https://www.thealternativedaily.com/3-reasons-to-stop-dying-grey-hairs-plus-4-natural-hair-colorants/. Thank you.